She's got Bette Davis eyes. Nominees: "Born Yesterday" "Father of the Bride" "King Solomon's Mines" "Sunset Boulevard"
First off sorry it has taken so long to get the next movie up. We started watching this one a few weeks back but then life got in the way including visitors, a nasty stomach illness ran through our family, and general life chores. But we finally found the time to watch it this past weekend so here are our thoughts. I've never heard of this movie before. I read the little blurb on IMDB.com about it before watching it, and it sounded boring as hell, and it turned out to be just as boring as I feared. It started off with Eve Harrington getting an acting award, and I must say that it is rather ironic that she got this award considering how poorly acted her role was by Anne Baxter. As she gets the award a group of people are hating on her and that is when we are transported back in time something around one year earlier to find out how we came to be at this spot of this young lady receiving an award and the hatred felt towards her. Going back in time we end up focusing on Bette Davis's character, Margo Channing, a highly skilled and sought after Broadway star. Shortly afterward Eve makes her entrance as a shy fish out of water who is following Margo's every move almost like a stalker, but that this point she simply seems to be a sweet young woman who is a huge fan of Margo's. At the start of Eve's relationship with Margo, it was like a stalker, and sort of creepy in a way, then it turned into a sort of girl crush which, although titillating, was almost more creepy. It was as if she wanted nothing more than she herself to be Margo. Slowly over time we find out how Eve is really a manipulative person who is manipulating all these different people, actors, directors, producers, in an attempt to become the next big Broadway star and replace Margo Channing, her supposed hero/mentor. I will give this movie kudos for being almost entirely about women and being female driven, this is a rarity today and I imagine it would have been even rarer in the 1950s. So to be female driven in a male driven industry and time period, and to win the Oscar for best picture is certainly an achievement. Although I don't need to endure this movie the first time or again to understand what kind of an achievement this is. All this is good to be female driven, however keep in mind that it is female driven from the standpoint of a manipulative conniving woman, and the drunkard starling, so it doesn't exactly put the nicest spotlight on women or showcase them from the best standpoint. So it is somewhat unfortunate that it wasn't a female driven movie with a few more positive viewpoints of women. But that being said, it might be hard to find a lot male driven movies that portray men in a positive light and not as abusive alcholics, or other stereotypes. Overall the movie was boring and somewhat predictable. The entire movie is simple scenes of prolonged dialogue, which I don't mind in and of itself, I just don't appreciate it when the dialogue is not written well and not acted well. 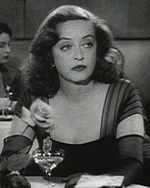 Although I will say that Bette Davis acting the part of drunk Margo at her boyfriend's birthday party was actually quite well done. At any rate, I would say this is only slightly better than Oliver! for the worst movie so far on this list and the Academy must have had something better to pick from in that year; The Father of the Bride (not the Steve Martin version but that is definitely Oscar worthy) and the original King Solomon's Mines, never seen it but I'm sure it can't be better than the Richard Chamberlain and Sharon Stone version.. As an aside, The American Film Institute has this as the 16th best film on their 1998 list of the top 100 movies and then dropped to number 28 in the 2007 list, so maybe I missed something. Next up The French Connection, classic Gene Hackman. Crash followed closely by The Great Zeigfeld, Casablanca, Around the World in 80 days, All About Eve, Oliver! She Said: All About Nothing. Okay. So I didn't find this movie as boring as Kurt did. In fact, I even quite enjoyed the second half, once Eve starts acting creepy and the everything falls down around Margo. But I can't say I really liked it, either. I was hoping I would, but I just found it all.... a little much. Eve was TOO perfect, and then TOO evil, Margo TOO damaged, Karen TOO caring, Bill TOO earnest, and Addison DeWitt TOO unlikable. I wasn't sure how I was supposed to feel about any of the characters, and as the movie has no real plot, if you don't connect with the characters, it's hard to get into the film. Don't get me wrong- I don't think a movie needs to have a plot. Not every movie needs non-stop action, and this one certainly doesn't have it (unlike "Around the world in 80 Days", which tried too hard to be non-stop action interspersed with pretty landscapes). And I did find Anne Baxter's portrayal of Eve quite interesting, even if I wasn't all that interested in Eve herself. I liked how we echo Margo's changing opinion of her, but faster because we have all the information whereas the characters obviously do not. I also appreciated that this was a "woman's" movie, in that it was primarily about woman and their relationships with themselves and other women. The men seemed mostly there as props and pawns to be used by Margo, Eve, and Karen, with I guess the exception of Addison DeWitt. I think I would've enjoyed the movie more, though, if it was just "All About Margo," with her facing her own doubts and insecurities about aging and herself without the Eve to pounce on them. I know Eve's the impetus for that to happen, but its was all a little too predictable. Of course Eve HAS to be not who she says she is, or else Margo is just being ridiculous and can't ever change... then again, what if Eve Harrington WAS exactly who she said she was? Would that have changed Margo's reaction and transformation? I dunno. All in all then, this movie was draggy in parts, over-acted in others, and intriguing not for the story presented, but more for my own imaginings of how it could have gone. I wish they'd made my version instead. I haven't seen this in ages but LOVED this movie as a theatre nerd, old-movie-obsessed teen. I really like Sunset Blvd, though, and am surprised this beat it out for the Oscar. Best moment of Sunset Blvd is when the aging actress comes onto her young male prey, "Hold me! Hold me like we were lovaaaaahs!"